The folks at ALLMAX Nutrition were kind enough to send the team at PumpUp some ISOFLEX protein powder. Our Director of Health and Fitness, Jonathan Levy, gives it a try! Disclaimer: The following review of ALLMAX Nutrition is my personal opinion. ALLMAX Nutrition has not compensated me or PumpUp Inc. financially for the review. The nutritional profile in ISOFLEX is great compared to other whey protein powders. One of the things some protein powders contain that I’m not a fan of are ‘fillers’. Fillers are calories added to the product that you don’t want. A big reason I like ISOFLEX is because it contains 90% pure protein powder. There are 27 grams of protein per scoop, 0.5 grams of carbohydrates and only 0.1 grams of fat. There are hardly any fillers! Overall, the nutritional profile of ISOFLEX is of high quality. I’d rate it 9/10. ISOFLEX sent me the Peanut Butter Chocolate flavour. Of the many protein powders I’ve tried, I found this was one of the better tasting supplements I’ve tried. Why? I found it mixed smoothly with water, so I wasn’t forced to use milk to enjoy the flavour (I prefer water vs. milk). Though the taste was great, I found the brownish color of the shake to be a bit unappetizing. However, like we all learned at school, “don’t judge a book by its cover!” I really enjoyed the shake both post-workout and as a snack between meals. The best part was the real chocolate chips, which are a nice treat. Overall, I’d rate the taste of ISOFLEX 9.5/10. After you work out, your muscle fibers get micro-tears due to the excessive load placed on your body. Your muscles go through a process called Protein Synthesis, where they get bigger. For this to happen, you need protein available in your body. I found that ISOFLEX gave me a good amount of protein for muscle growth. My recovery was great and I was ready to work out again a day or two later (please note: there are many other areas that you need to take care of in order to ensure full recovery. If you’d like more details, feel free to email me or comment on this post). Overall, with 27 grams of protein, ISOFLEX gives you a substantial amount of protein. I’d rate the post-workout recovery 8.5/10. 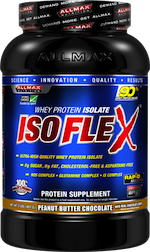 ISOFLEX by ALLMAX Nutrition is a great Whey Isolate protein shake. I’d definitely recommend this product to most people who exercise. It’s excellent for post-workout or to use throughout your day. While I tried Peanut Butter, it also comes in 6 other flavours. Overall, I’d give ISOFLEX a solid 9/10. If you have any questions on my experience with ISOFLEX by ALLMAX Nutrition, feel free to email me at jonathan@pumpup.co. Ps. If you haven’t already, make sure you download PumpUp!